Spring outfits are usually not about shorts and dresses; they’re about leaving big coats and jackets at home. 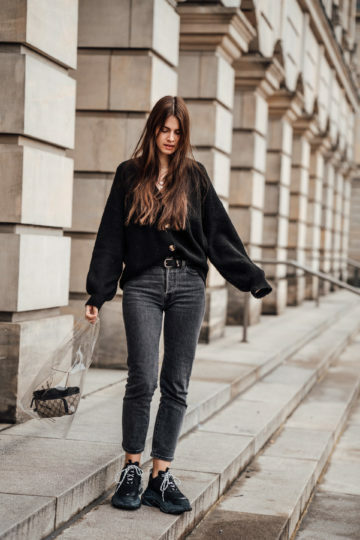 In spring, you can finally wear all your favourite jackets such as leather jackets or bomber jackets with only a top or t-shirt beneath, you don’t need UGG Boots or other winter shoes but can wear all your white sneakers and sometimes even sandals. These are definitely spring basics everybody need. Other spring basics are ripped jeans and light shirts. In winter, you can’t wear those ripped jeans because it’s too cold with all the holes 😉 But in spring you can finally get them out again! Even light shirts and off shoulder shirts are items you can’t wear without something beneath in winter. So we always have to wait for spring until we can finally wear them they way they’re supposed to be worn. In this case, I combined a pair of destroyed black jeans with a white shirt I usually take with me when I’m travelling somewhere warm and my new Bullboxer shoes. The shoes are definitely the highlight of the look and I’m so happy I was able to wear them the other day. What do you think about my look and my new shoes?